Southampton is internationally recognised as a centre of excellence in the development of energy harvesting devices. The University’s pioneering research into energy harvesting has had a significant impact on the economy, public policy and international standards. Electrical harvesting is the conversion of freely available ambient energy such as vibrations into electrical power. 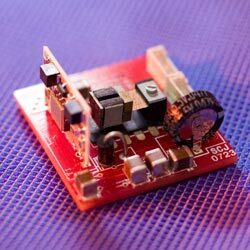 This power can then be used to supply low-power, autonomous electronic systems such as wireless sensor networks used in the energy, transport, aeronautical and military sectors. Energy harvesters can be used to replace batteries in wireless devices reducing the maintenance costs of replacing the millions of batteries that are thrown away each year and enabling these wireless sensors to be placed in inaccessible and hazardous locations. Research at Southampton is leading the way in developing devices that can turn these vibrations into useable energy in a cost-effective, user-friendly way. In the future energy harvesting is set to play a significant role in the powering of autonomous electronic systems and wireless sensor networks around the globe. Studies predict that the market for energy harvesters will be worth more than $1.9bn by 2017. Southampton’s research team has been working for more than 15 years on a solution to our growing energy needs. Since their research began they have produced the world’s first piezoelectric vibration energy harvester and high efficiency electromagnetic energy harvesters. Their work has placed them at the forefront of vibration energy harvesting research internationally. Today they continue to lead the research into realising the full potential of vibration energy harvesting. Southampton’s research has spearheaded the development of a multi-million pound industry and enabled large-scale deployment of wireless sensors in the rail network and other industry. In 2004 the Southampton team commercialised its research by launching the spin out company Perpetuum. The company is a global leader in vibration energy harvesting and has already attracted almost £10m in venture capital. It has developed the world’s first practical electromagnetic micro-generator that is capable of delivering enough power to transmit large amounts of data. This wireless sensor system is already monitoring the condition of bearings on hundreds of UK and European trains to improve rail safety and reduce maintenance costs. Its generators have also been used by Shell to help monitor the condition of its gas field equipment in Norway. Southampton’s research has also helped develop international standards, influenced the decisions of funding bodies and raised the profile of energy harvesting among industry and the wider public. Professor Steve Beeby and Dr Geoff Merrett, from Electronics and Computer Science at the University, are leading the UK’s Energy Harvesting Network – a £112,000 initiative to link the UK’s leading industrial and academic groups. Steve and Perpetuum President Roy Freeland are also assisting in the development of international standards for energy harvesting. Talk to our research team and find out more about this work. Professor Steve Beeby, of the Smart Electronic Materials and Systems group led the research on this project.